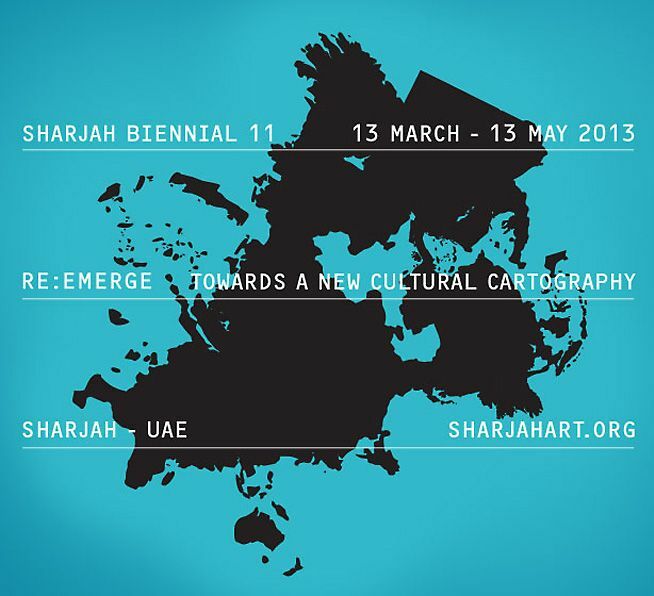 Neoliberalism(s) is a software-questionnaire-mapping work exhibited in 11th Sharjah Biennial, 13 March – 13 May 2013. It aims to grasp the diverse perceptions of expatriates living in UAE about the fierce nature of the neoliberalism. “Almost everybody who lives in Dubai also lives somewhere else” says Rem Koolhaas in the second Al Manakh, a study of the Gulf region. The expatriates in UAE experience different geographies, weathers, languages and above all different social worlds in their home and host town.Yet, however different the cities they live in, they share common ground especially in respect to the globally dominant economic policies and the market logic. In other words, UAE is composed of subjects exposed to diverse neoliberal fantasies rendering the emirates one of the few regions where one find such relational bridges between different neoliberalisms. 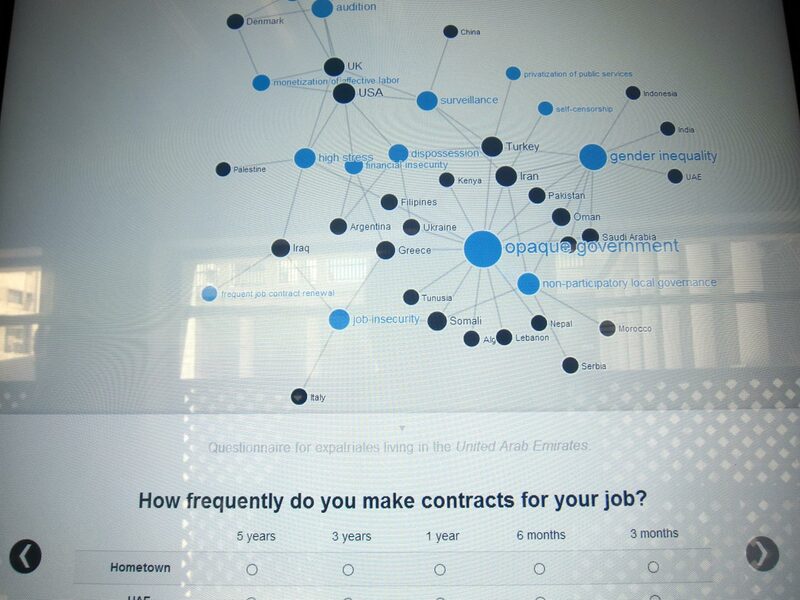 Neoliberalism(s) is a software-questionnaire-mapping system aims to capture the relationships between expatriates’ subjective encounters with neoliberalism in UAE and in their hometown. It utilizes the commonly used survey interaction method, but through a new satire interface that is available both online and onsite. The online questionnaire application has taken a snowball route and propagated on participants’ social relationships virally, targeting an audience whose profile is identified via social media, Facebook, Twitter etc. 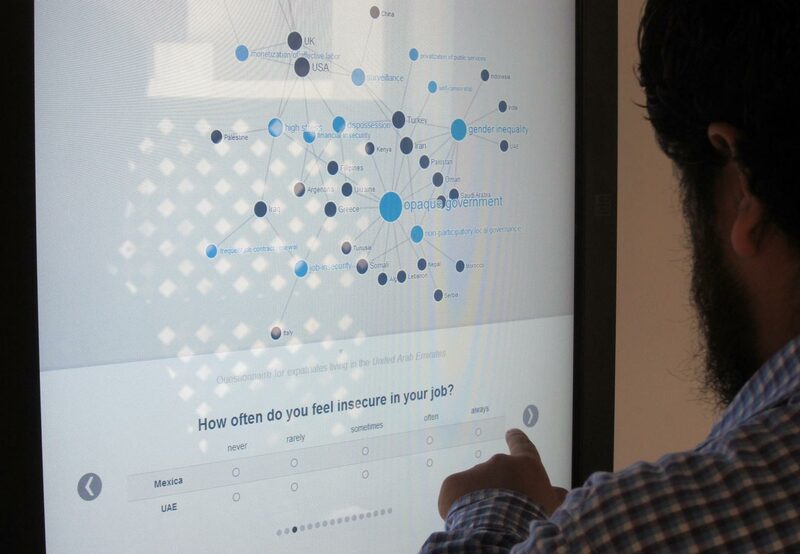 The questionnaire is available in the exhibition through a touchscreen application. 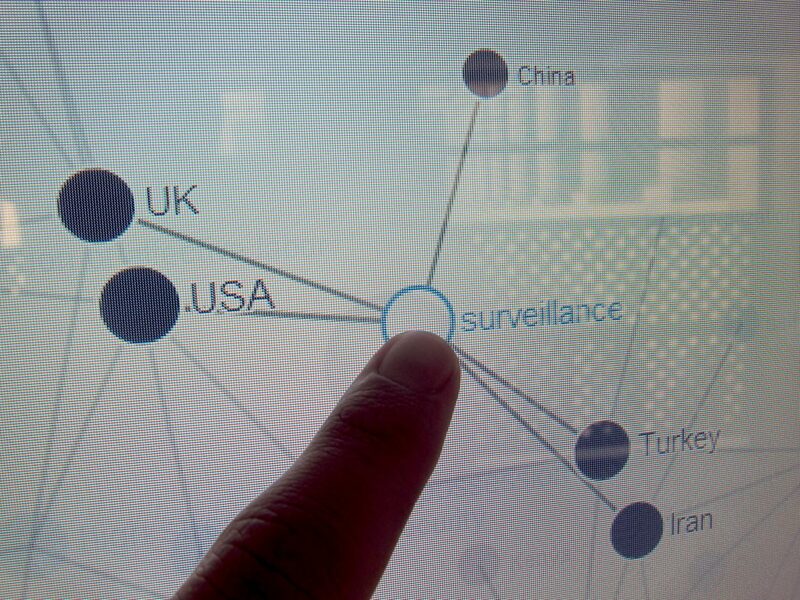 Both online and onsite responses to the questions are gathered in real-time on a central database which drives the network map. Questions demand both factual and imaginary reactions by design. 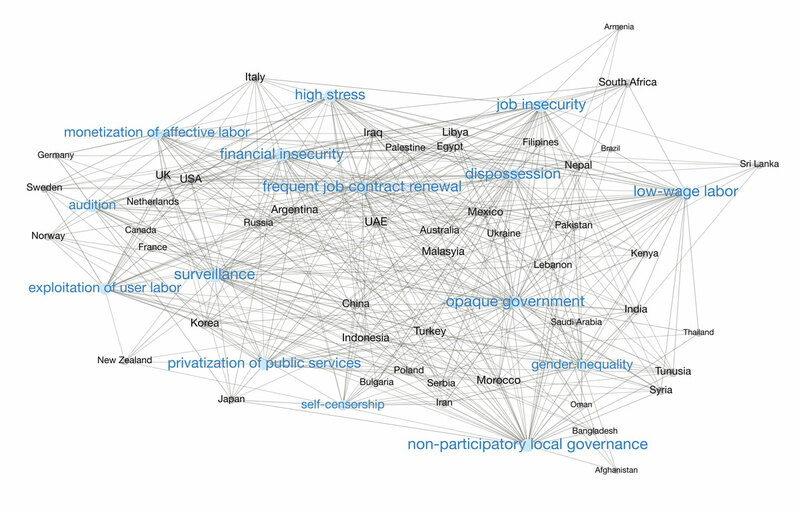 The generated data is analyzed and mapped into network diagrams, which show similarities and differences of aspects of particular neoliberalisms of the world. Print: Subjective network map of countries and neoliberal concepts generated by the artist himself through taking the survey for all the countries. 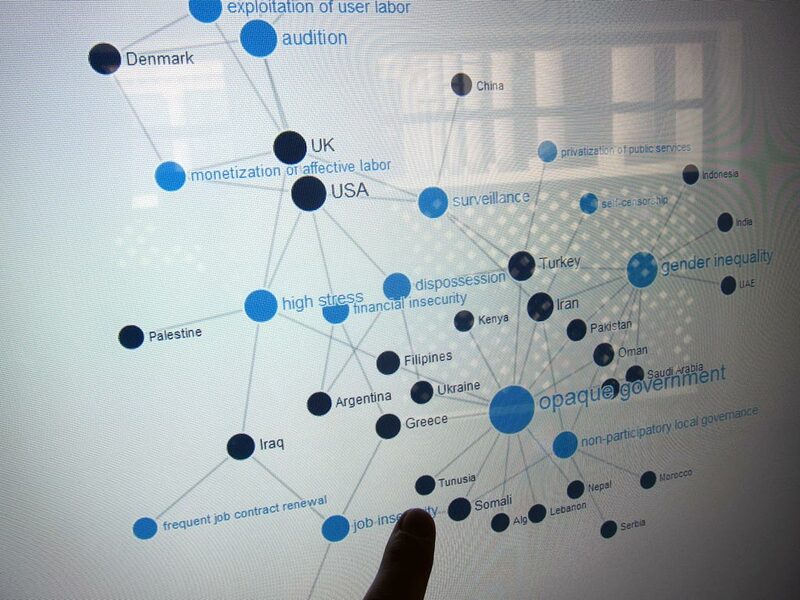 Touch-screen: Questionnaire and collective map, generated in real-time by the participants’ responses online and onsite.